Valmik Thapar has spent 31 years working to save wild Tigers, has written eight books on Tigers and presented the film series 'Land of the Tiger'. He founded the Ranthambhore Foundation, which works to save Tigers across India. No other activist has been more passionate about Tiger conservation in recent times. As part of his ongoing crusade he published the fascinating anthology 'Saving Wild Tigers' in 2001, which focuses around a century of Tiger conservation efforts around the globe. Contained therein is his essay "The Big Cat Massacre", of which excerpts are presented here by his courtesy. It was 7 a.m. and the smog and mist of the filth of both Delhi and all its satellite towns was only just lifting. We drove for over an hour and then into the sprawling mess of Ghaziabad's bylanes until we arrived at the District Forest Officer's residence. I was with the Inspector-General of Forests and as we stepped out of the car and walked a few yards round a corner - there in front of us were laid out and hanging the skins of so many dead Leopards that the first sight of them took our breath away and stunned all of us into silence. In a numb state we moved forward, looking slowly at what must have been the tip of an iceberg in the ongoing massacre of India's wildlife. How many thousands of mornings I have waited even for the faintest sign of a Leopard in India's forests. I have craved a glimpse of them. In over 25 years I have only seen 28 living Leopards and here I was surrounded by 50 dead ones. Some were enormous in size, the skins shining in the early morning sun. There were hardly any marks on them - probably poisoned or electrocuted - a couple appeared to have been caught in foot traps and then smashed on the head, as suggested by congealed blood. They all looked freshly killed - over the last six months. They had been cured somewhere and waxed, and even had the signature of the 'artist' at the back. They were perfectly folded like table cloth - it was a blood curdling sight. I could imagine the horrors that these animals must have been put through - their agony, their death howls. Standing silently in the midst of the skins my head, my heart, my every pore seemed sent to oblivion. I realised that the recovery of Ranthambhore was probably only an illusion. I touched, looked and turned over some of the skins - my colleagues from the ministry were shocked. In a way, we were as close to tears as anyone could be. I moved an enormous Tiger skin - its foot looked punctured by a foot trap, its flank had spear or knife marks, suggesting the Tiger had roared in fury and pain and the poaching gang had come by and speared it down. My vision of the end of the century was ripped apart, torn in pieces; it was covered in blood. There was no doubt that hundreds of Leopards and Tigers were being decimated by the co-ordinated working of poaching gangs right across India. In the core of my head I carry into the new millennium only a vision of skin and bone, of congealed blood, of a mass of skins, of the horrors of what man does. This is my 'new millennium', my utter, utter shame at our total impotence to save the wilderness of a great nation, my devastation at the global indifference to protecting our wilderness across the planet. I didn't realise that the beginning of the twenty-first century would get even worse. On 12 January 2000, a day I will never forget, acting on a tip that must have resulted from the 19 December seizure, a police party with wildlife inspectors raided three premises in Khaga, Fatehpur, in the North Indian State of Uttar Pradesh, and seized 70 Leopard skins, 4 Tiger skins, 221 blackbuck skins, 18,000 Leopard claws, and 132 Tiger claws. It appears that both these seizures are linked. The three premises were illegal factories that were tanning and curing skins. By 15 January, from around these premises more than 185 kgs of Tiger and Leopard bones were recovered, revealing the horrifying state of affairs. Wildlife governance was in a complete state of collapse and clearly 'operation-wipe-out' was on. 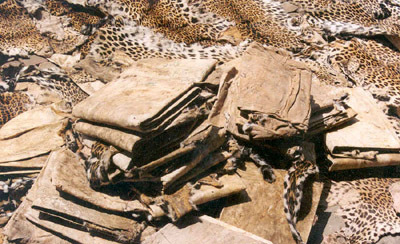 As if this was not enough, by May two more seizures in Haldwani resulted in a recovery of 80 more Leopard skins and endless other skins. The twenty-first century had dawned with a nightmare. The biggest haul of large cat skins had taken place over a few weeks at the end of the one century and the beginning of another. Never before had there been a haul of this magnitude and scale in the history of India. Skins, bones and derivatives of 1400 Leopards and 50 Tigers — all in one state! Imagine what has been processed in these factories over the last decade.